How Apple, NXP Semiconductor, and Garmin shares outperformed the market over the past year. In many ways, the wearables market ends 2016 with more questions than answers. One of the most discussed tech markets of 2014 and 2015, the industry has evolved in some important ways this year. Competition among larger suppliers intensified, and new questions emerged about the long-term potential of the wearables market. Those concerns didn't restrain leading wearables names like Apple (NASDAQ:AAPL), NXP Semiconductors (NASDAQ:NXPI), and Garmin (NASDAQ:GRMN) from outperforming the market this year. So what drove these wearables companies in 2016, and more importantly, what does the year ahead hold in store for each company? Let's examine each one further to get a clearer sense. The world's largest publicly traded company earns its place on the list with a few important caveats. First, as likely noted from the chart above, Apple's 11.5% performance this year only bested the Nasdaq Composite by a mere 2 percentage points, far from a heady outperformance. Equally important, Apple earns a mere fraction of its total revenues from the Apple Watch. The caveats end there though because despite all the previous qualifiers, the fact that the Apple Watch remains easily the best-selling smartwatch in the world alone justifies its place on this list. With the prime selling season for the Apple Watch 2 only now drawing to a close, the jury remains out as to whether consumers will embrace Apple's most recent smartwatch with the same enthusiasm with which they bought its predecessor. A recent, if not unusual, email from Apple CEO Tim Cook to Reuters claimed, "during the first week of holiday shopping, our sell-through of Apple Watch was greater than any week in the product's history... we're on track for the best quarter ever for Apple Watch." More broadly, many early reviews still frame the Apple Watch as more of a want versus a need, a stark contrast from smartphones like the iPhone most modern consumers deem a necessity. If anything, the issues with the Apple Watch 2 reflect the broader engineering challenges -- such as our bodies' interference with advanced biometric sensors -- more than any specific design errors on Apple's part. However, with the Apple Watch apparently selling quite well and Apple's likely release of another improved device later in 2017, investors should remain generally optimistic about the course of Apple's place as a top wearables company. Rather than looking for winning companies in a specific market, many investors favor finding the leading suppliers for an entire industry instead. As evidenced by its strong performance this year, secure near-field communication (NFC) chipmaker NXP Semiconductors remains at the forefront of the on-going boom in mobile payments. This is great news for NXP as it appears mobile payments are being supported by an increasingly wide array of wearables OEMs. Devices from FitBit, Samsung, Jawbone, Microsoft, and more currently allow mobile payments or will do so soon. Furthermore, Alphabet's Android Wear platform is set to begin supporting Android Pay, which should further hasten the technology's adoption. As the leading provider for secure NFC payments chips, NXP stands to benefit from this widespread trend. More broadly, its emphasis on secure connections places NXP Semiconductor's chips at the heart of the Internet of Things (IoT) trend as well. Importantly, investors looking to benefit from NXP Semiconductor's continued growth will need to look to shares of Qualcomm (NASDAQ:QCOM), which is set to purchase NXP in an all-cash deal that will close at some point in 2017. Qualcomm stands as an outstanding company in its own right, and further incorporating NXP into its operations should only help accelerate its dominance of the burgeoning mobile payments space. 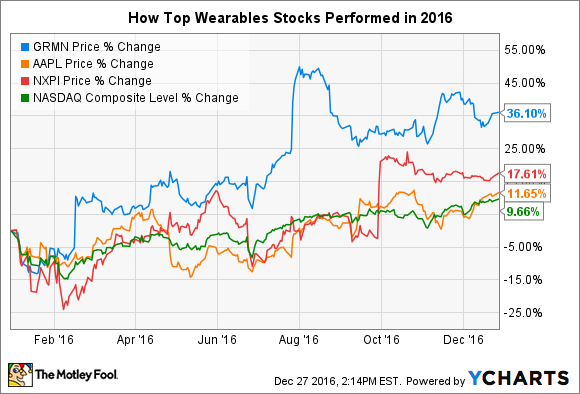 Last but far from least, Garmin stock outperformed all other wearables companies in 2016 based on the soaring popularity of its various wearables. The company has adroitly leveraged its specialization in GPS to create extremely popular wearables for outdoors, running, and general activity tracking to great effect. As the most recent example, strong consumer reception to its wearables drove 32% sales growth in its outdoor segment and a 28% increase in sales in its fitness segment in Garmin's most recently reported quarter. Incorporating premium materials like sapphire lenses have also helped Garmin position many of its wearables at the higher end of the market, which likely explains the increases the company has seen in its gross margins of late. That being said, headwinds in Garmin's automotive segment, where revenues continued to meaningfully decline last quarter, have limited the net benefit of Garmin's wearables success. This could also limit the upside in Garmin shares in 2017. Analysts only expect Garmin's sales to climb 1.4% in the coming year, and none of the 14 sell-side analysts who cover the stock rate Garmin shares as a buy. So while Garmin has clearly performed well in 2017, investors will want to further investigate whether they truly believe Garmin can continue to execute on its wearables strategy before investing in 2017.